Ben Coulson pinpointed the positives as Worthing Raiders began 2018 with a National 2 South defeat at high-flying Redingensians Rams on Saturday. Rams were in blistering form, running in seven tries on the way to a resounding 39-26 success. Raiders looked overawed in the early exchanges and a fast start from the home team had seen them threaten to run away with things. Worthing weathered the early storm, though, managing to score a fourth try - earning a bonus-point - courtesy of Matt McLean’s work with the last play. Raiders assistant coach Coulson insists failure to come away from the game with nothing would have been unjust. He said: “Another four-try performance is obviously positive and the manner in which we challenged again showed development. “It is more evidence that this group is moving in the right direction. “Coming away with nothing would of hurt, without doubt. Pleasingly, there is a real hunger to make every opportunity with and without the ball count. “There is however an increasing level of patience and understanding within the team. We know tries won’t be scored every first phase and that building pressure is a fundamental of the game in both attack and defence. Coulson praised the resilience shown by Raiders in the defeat to third-placed Rams. A barrage in the opening 20 minutes from the promotion-hopefuls had threatened a long afternoon for Raiders but they regrouped. Coulson added: “Credit is due for the manner in which we reacted. “It is always difficult playing a top-three team, they are top-three for very good reason. Their first 20 minute performance would have been good enough for most, if not all teams in the league. 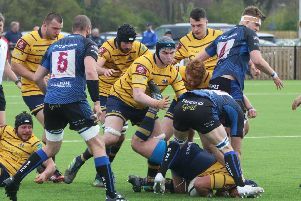 Raiders face another tough task as they welcome fifth-placed Redruth to Roundstone Lane for their first home game of 2018 on Saturday. Worthing have won each of the past five matches they’ve played on home turf, a run Coulson is looking to see extended. “We’re going into the Redruth match looking to score four tries and win the game,” Coulson added.